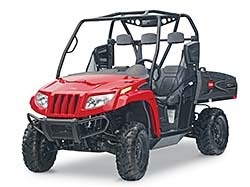 This line includes two versatile, gas-powered electronic fuel injection (EFI) models — the 500 EFI and 700 EFI — that support more than 40 different accessories for year-round project needs. These powerful, 4-wheel-drive vehicles offer hard-working hauling and towing capabilities, as well as comfortable seating for three. They can also be customized with a wide range of accessories including windshields, cabs, plow blades, light kits, winches, a stereo, and more.